Sexual violence is an issue that impacts all communities, and disproportionately impacts womxn of color, trans and queer folks, and young people. We welcome and invite all communities to be a part of this march to end violence. Join Students for Choice at the U of U and Westminster College as we march to end sexual violence as center the voices and lived experiences of those most impacted by sexual violence. 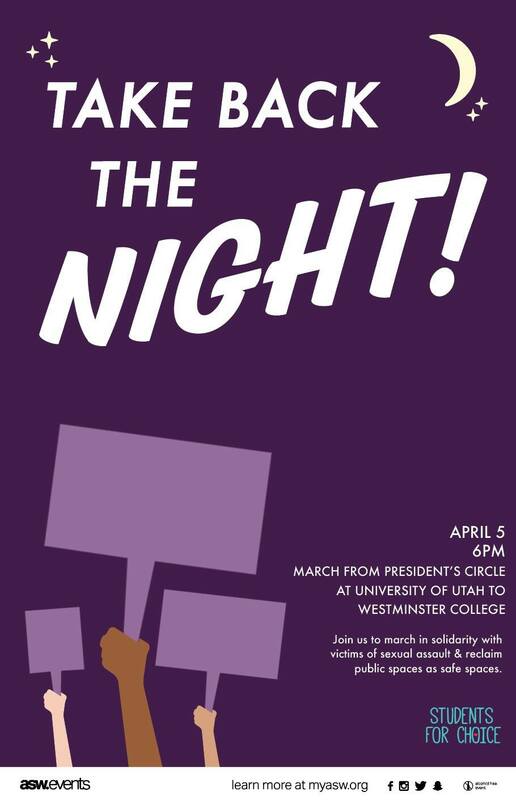 We will meet at the U’s President’s Circle at 6pm and we will march to Westminster’s Bassis Lounge. Free Take Back the Night t-shirts will be provided on a first come basis at President’s Circle. Lyft promotion codes will also be available for folks to use if they don’t feel like walking the entire march and also if they need to take a lyft before/after the march. The march will end with an informal reception that will include FREE FOOD, SPOKEN WORD, ARTIVISM, an OPEN MIC, and more cool stuff! Come, and invite all your folks to come!